This article describes the ongoing litigation between the makers of Star Control: Origins (SC:O) and the makers of Ghosts of the Precursors (GOTP). SC:O is being published and developed by Stardock Corporation, who purchased several Star Control intellectual property assets from Atari at bankruptcy. GOTP is being developed by Paul Reiche III and Fred Ford, the designers of the first two Star Control games with Star Control intellectual property of their own. Both parties claim that the other has violated their intellectual property rights. Both parties will need to prove the validity of their Copyrights, Trademarks, and licenses, and then prove that the other party has violated their exclusive rights. 1.1 Who owns the copyrights in Star Control 1, 2, and 3? 1.2 Who owns the copyright in the music of Star Control? 1.3 What rights are protected under copyright? 1.4 So what caused the copyright dispute? 1.5 How can Stardock legally sell games copyrighted by someone else? 1.6 How does a store like Steam handle a Copyright dispute? 1.7 Can Copyright protect characters and plot lines? 2.1 How does a licensing agreement work? 2.2 What is in the 1988 Licensing Agreement? 2.4 But is the agreement still valid? 3.1 Who owns the Trademark in "Star Control"? 3.2 What rights are protected under Trademark? 3.3 What is the dispute? 3.4 What about the Trademark in "The Ur Quan Masters"? 3.5 What about Stardock's Trademark applications for certain aliens? 4.1 What are the allegations of unfair competition in each lawsuit? 4.2 Why does it matter if Reiche and Ford call themselves the "creators of Star Control"? 4.3 Why does it matter how Stardock described their relationship with P&F leading up to SC:O? 5.1 Who will win in court? 5.2 Can this be settled out of court? 5.3 What is the worst case scenario for Star Control: Origins? 5.4 What is the worst case scenario for Ghosts of the Precursors? 7.6.7 Kellogg Co. v. National Biscuit Co.
Who owns the copyrights in Star Control 1, 2, and 3? 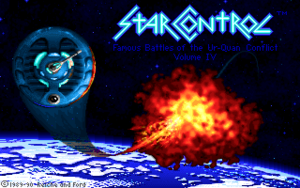 The Star Control title screen, which attributes Copyright to Reiche and Ford. Star Control 3 belongs to multiple parties, as Accolade developed the game using existing copyrighted content from the first two games. 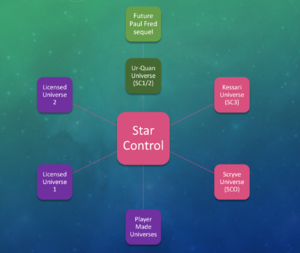 Reiche and Ford agreed to license their intellectual property in Star Control 1 and 2 to Accolade for the development of Star Control 3 (which is documented in an addendum to their original agreement). 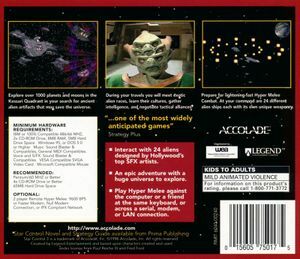 This is noted on the Star Control 3 CD jewel case, stating Accolade as the copyright holder, while using characters under license from Reiche and Ford. In 1996, Accolade registered the Copyright for Star Control 3 with the United States Copyright Office, which was eventually purchased by Stardock at Atari's bankruptcy (after Atari had acquired it from Accolade). Who owns the copyright in the music of Star Control? Music is often separate from the game itself. Section 1.5 of Addendum 3 to the 1988 contract includes "music" under the the intellectual property "owned by Reiche. "(pgph 1.5) This suggests that Reiche and Ford might own the music (and not Accolade or any other publisher), but it still leaves an open question about whether the musicians own the music or assigned it to Reiche and Ford at contract. When Reiche and Ford made Star Control 2, they held a contest for musicians to have their music in the games. One contest winner was Riku Nuottajärvi, who has since released new remixes of that music without objection from any publisher, or from Reiche and Ford. Riku has since been hired by Stardock as the music lead for Star Control: Origins, and has begun remixing some of the original music for the new game. Neither lawsuit specifically disputes ownership in the music, at present. What rights are protected under copyright? A copyright holder can make derivative works based on the original work. This box describes Ford and Reiche as copyright holders in Star Control 2. Copyright is secured automatically whenever a work (such as computer software, literary work, or other authorship) is created, and does not need to be registered. This gives the copyright holder exclusive rights to the authored work, including the right to reproduce, distribute, or sell that work. The copyright holder also controls the right to create derivative works based on the original work. For example, a sequel to a game or a movie using characters and other elements from the original would be a derivative work, and needs the permission of the original copyright holder. The creator of the derivative work would be limited to copyrights in the new elements only, and their rights would exclude anything copied from the pre-exising work. So what caused the copyright dispute? On October 19 2017, Stardock began selling the original copyrighted games through Steam. Reiche and Ford said they did not authorize this and requested a takedown, and Stardock responded that Reiche and Ford's request includes "Star Control 3 which they admit they had no involvement". In fact, Star Control 3 does use copyrighted content from the first two games, and states that they used characters under license from Reiche and Ford. Star Control 3 is a derivative work based on Star Control 1&2, which Accolade could only create with permission from Reiche and Ford, as seen in the 1995 addendum to their original agreement. How can Stardock legally sell games copyrighted by someone else? How does a store like Steam handle a Copyright dispute? The Digital Millennium Copyright Act (DMCA) holds online service providers liable whenever their users violate copyright law. As required by the DMCA, services such as Steam and GOG provide a tool to copyright holders to report any infringing content. The DMCA requires service providers to takedown infringing material once they are notified, but also includes safeguards to protect legitimate content from erroneous or fraudulent takedowns. This process only affects the liability of a service provider like Steam. These services are often uncertain about what is or is not infringing, due to information that is only known by the parties, and it is neither practical nor necessary for them to judge the validity of every notice or counter-notice. Can Copyright protect characters and plot lines? Copyright does protect more specific forms of expression, and thus courts have decided cases to protect characters such as E.T.,(pgph 6-7), Spawn, and Rocky (as well as secondary characters including Adrian, Apollo Creed, Clubber Lang, and Paulie). (section A.2) Even the Batmobile had distinctive enough characteristics to be protected by Copyright. In 1996, Accolade owned the Trademark in Star Control. They also had Copyright in Star Control 3, but licensed original characters from Reiche and Ford. How does a licensing agreement work? An intellectual property holder can legally transfer any of their rights to a third party. This can be any or all of the copyright holder's rights, including the right to sell and distribute copies of their work, or the right to adapt their work into a new derivative work. A licensing agreement is a contract, and the terms of such a contract can be whatever the parties agree is fair. What is in the 1988 Licensing Agreement? A 1995 addendum to the agreement granted the right to Accolade to develop Star Control 3, with intellectual property under license from Reiche and Ford. (Another addendum for an unfinished Star Control 4 game expired after no game was produced.) Accolade effectively purchased from Reiche/Ford the rights to use pieces of the original games in the new sequels, but those parts would still belong to Reiche/Ford, with only the truly new parts of the sequels belonging to Accolade. Accolade was eventually bought out by Atari (formerly Infogrames), who then took the place of Accolade as the legal license-holder to Reiche/Ford's copyrights. Atari declared bankruptcy in 2013 and sold its assets to various parties. Stardock purchased all Star Control assets from Atari at bankruptcy,(page 14) who claims that these assets included the 1988 Licensing Agreement. But is the agreement still valid? In a 2011 email thread between Reiche and Atari, both parties agreed that the 1988 License had expired years prior. (apr 25) In 2015, Stardock had stated "my position is that Stardock doesn't have the legal rights to the original lore either. Or, if we did, we have long since refuted those rights." Years later, conversations between Stardock and Reiche eventually led them to discuss the License Agreement. In October 2017, Stardock asserted to Reiche that the games were on sale at that time, and thus generating royalties at the minimum required by the original license. Reiche responded that Atari had agreed that the license expired during the 2001-2011 period of non-sale, and that it would be impossible for Stardock to regain those rights. Paragraph 7.1 states that the Agreement terminates upon bankruptcy of the publisher,(pgph 7.1) which Atari filed for in 2013. The 1998 addendum to the 1988 agreement included a three year term, which would have granted Accolade rights to any game they made during this term, but states after three years that the “Reiche Intellectual Property granted hereunder shall revert to Reiche”. (pgph 4.1) This would have expired on April 1, 2001. Reiche and Ford's October announcement about Ghosts of the Precursors. Stardock alleges that this announcement violated their Trademark in "Star Control". Who owns the Trademark in "Star Control"? What rights are protected under Trademark? According to the United States Patent and Trademark Office, "A trademark is a brand name. A trademark or service mark includes any word, name, symbol, device, or any combination, used or intended to be used to identify and distinguish the goods/services of one seller or provider from those of others, and to indicate the source of the goods/services." What about the Trademark in "The Ur Quan Masters"? Shortly after filing their lawsuit, Stardock also filed an application for a Trademark in "The Ur Quan Masters", the name of the open source port of Star Control II that uses source code released to the fan community by Reiche and Ford. The United States Patent and Trademark Office (USPTO) responded by asking Stardock to include evidence that they have been in fact using "The Ur Quan Masters" at commerce. Shortly thereafter, Reiche and Ford also filed an application for the same Trademark, with the USPTO responding that their application may be delayed pending the decision on Stardock's application. A successful Trademark application would give someone the exclusive right to use "The Ur Quan Masters" in commerce. What about Stardock's Trademark applications for certain aliens? A few days after Reiche and Ford filed their counterclaim, Stardock filed applications for several alien names from Star Control I and II, including "Arilou", "Pkunk", "Mycon", and so on. 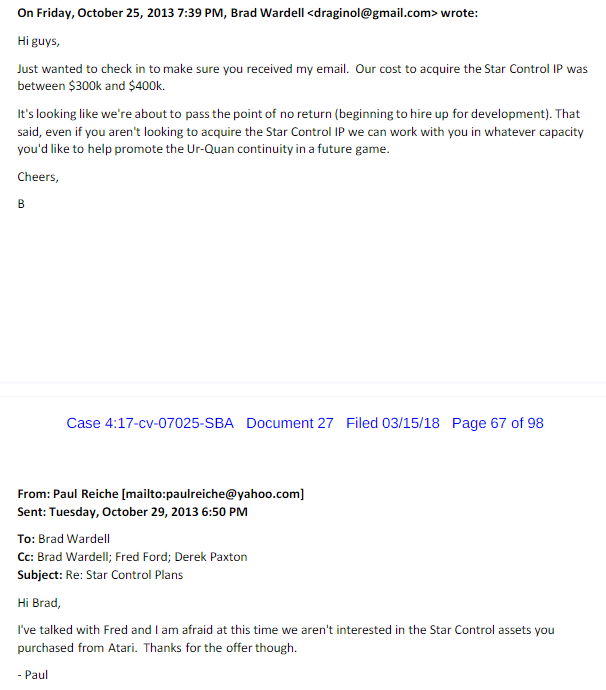 (below) According to Brad Wardell, the applications were filed in response to Reiche and Ford calling in their Counterclaim for the original Star Control trademark (registration number 2046036) to be canceled (pgph 129-130). Hypothetically, this could give Stardock the exclusive right to these aliens, if the registration is successful. According to the USPTO Trademark Manual, "marks that merely identify a character in a creative work, whether used in a series or in a single work, are not registrable". That being said, courts have found that distinctive characters such as Mickey Mouse have acquired enough a secondary meaning to be protected under Trademark law. Stardock created an image to describe how the games are connected, as reported by Ars Technica in October 2017..
What are the allegations of unfair competition in each lawsuit? Both sides have alleged that the other party has committed Trademark infringement, which falls under the definition of "unfair competition". More than this, each side has accused the other of "unfair competition" by making statements that might confuse or deceive people that Stardock and Reiche and Ford are somehow affiliated. 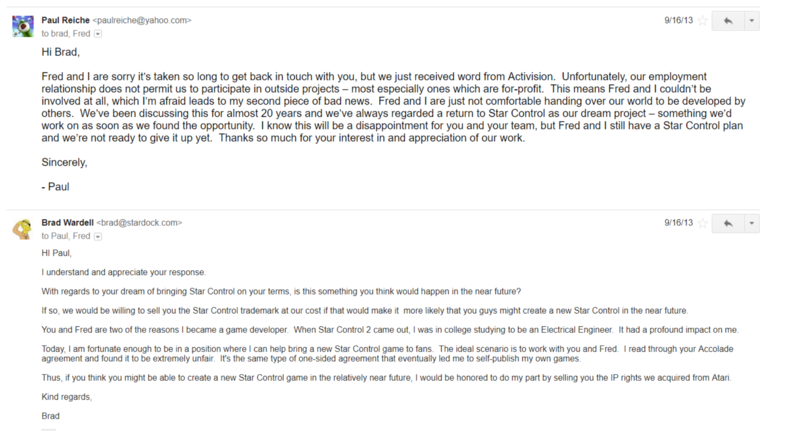 Why does it matter if Reiche and Ford call themselves the "creators of Star Control"? Stardock's lawsuit further states that "Reiche and Ford may not have created any of the artwork, animation or characters incorporated in the games, or otherwise substantially contributed to the authorship of Star Control I and Star Control II". Since Stardock's legal claim appeared, alleged members of the Star Control 2 development team have appeared to credit Reiche and Ford as the driving creative force behind the game. This includes Greg Johnson, who has credited Reiche and Ford for "having created the games", and described Reiche as "the creative genius of this entire Universe". Previous publishers have credited Reiche and Ford as the "creators of Star Control" in 1998. Fans have colloquially called them the creators in the 1990s, and 2000s. Journalists have followed suit,, and continued to call them the creators in recent years. Prior to the lawsuit, Stardock's CEO referred to them as the creators in 2014, 2015, as well as 2017. Stardock now publicly describes Reiche and Ford as the designers. Why does it matter how Stardock described their relationship with P&F leading up to SC:O? 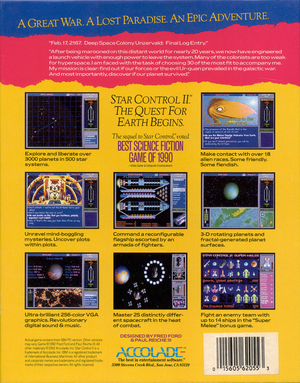 Reiche and Ford have alleged that Stardock has made "false or misleading statements concerning Reiche and Ford’s involvement with and connection to Stardock’s goods and services, including, but not limited to, Star Control: Origins, is likely to cause confusion or mistake or deception as to the affiliation, connection, or association of Stardock". There could be legal consequences if Stardock has overstated Reiche and Ford's involvement in ways that have confused fans. Without exact details of their conversations, it is not clear what kind of relationship existed between Stardock and Reiche and Ford, prior to the lawsuit. Based on public statements as early as 2013, Stardock's CEO stated that Reiche and Ford were "getting permission to work with us". In a 2014 interview, he further stated that "we'll be talking to Reiche and Ford as we go forward", and that he "talked to them quite a bit about what level of involvement they would like to have in the new game", but that they needed Accolade's permission to work together. Reiche and Ford have categorized this as false or misleading in their counter-claim, stating that they had "declined any involvement because they did not want Stardock or anyone else to further develop their world, and they had always planned to work on it themselves in the future." In 2016, Stardock's CEO stated that Reiche and Ford had been supportive of Star Control: Origins. After the GOTP announcement, the Stardock CEO initially stated that GOTP "was the result of some years of effort on our part to talk them into doing that". and outlined the connection between Star Control: Origins and a "future Paul | Fred sequel" in an interview. The Stardock CEO has stated that they met once at at conference, where "they came to our booth and we were supposed to have dinner but our schedules got tight". Who will win in court? This is a multi-dimensional dispute, and it is unlikely anyone will win on every issue. This article attempts to provide the most accurate information possible, grounded in evidence and law. Readers may speculate. If it goes to court, the decision ultimately belongs to a judge. Can this be settled out of court? In theory, yes. In fact, 95% of cases are settled before trial. Whether a settlement will actually happen will depend on how strong each party thinks its legal position is, how much they are willing to compromise, and of course the individual personality traits involved. It is possible that further settlement offers will be made, as these are just opening offers from each side. After those offers were published by Reiche and Ford, settlement negotiations have been ordered by a magistrate to be kept private. There will be a settlement conference May 14, 2018. What is the worst case scenario for Star Control: Origins? Before Star Control: Origins was released, Reiche and Ford asked for an injunction to stop Stardock from "all use of any creative material from Reiche and Ford’s Star Control Games in Star Control: Origins". (pgph 136a) This echoes their request in private settlement. (sec 5) If an injunction had been issued, it could have caused developmental problems and delays for Origins depending on how deeply the infringing material was embedded in Origins and how much reworking would have been required to remove it. In August 2018, Reiche and Ford issued a DMCA takedown notice against the Star Control: Origins Fleet Battles Beta, as well as the "Arilou" and "Chenjesu" DLC packs that were scheduled to be released with the game. In response, Stardock filed a motion for an injunction against further DMCA notices being served against Origins, and Reiche and Ford agreed to refrain from sending any more DMCA notices while the issue was before the judge. However, when Stardock's motion was denied on December 27, 2018, Reiche and Ford promptly sent new DMCA notices against the game itself, which was released on September 20, 2018. Reiche and Ford's post in their Dogar and Kazon blog cites an example of how the expression of interstellar travel in Origins is (according to Reiche and Ford) "substantially similar and/or derivative" of Star Control II, and claims that there are "many such examples" of copyright infringement in SC:O. While Stardock has since issued counter-notices to resume the sales of the game, it shows that Reiche and Ford already claim that SC:O infringes on their copyright. What is the worst case scenario for Ghosts of the Precursors? Stardock's lawsuit claims ownership of the "Star Control" Trademark, as well as the "Accolade marks" including "Ur Quan Masters". (pgph 29, 47-48) Stardock has further attempted to register numerous Trademarks in names and terms from the original games. (below) Hypothetically, this might prevent Reiche and Ford from making a game unless they change the names of all the aliens. Stardock's Complaint also seeks to "invalidate Reiche’s and Ford’s alleged copyrights, including any registrations they have obtained in connection therewith" (Prayer for Relief x). 1988-10: Accolade and Reiche/Ford enter into an agreement to develop three games. 1990-07: Star Control is released, created by Reiche and Ford. 1992-10: Star Control 2 is released, and is acclaimed as one of the best games that year. 1996-09: Star Control 3 is released, based upon characters created and used under license from Paul Reiche III and Fred Ford. 1997: Compared to the first two games created by Toys for Bob, the third game from Legend Entertainment is not as commercially or critically successful. 1998-09: Toys for Bob develop new games and franchises, and press and advertisements continue to describe them as "the creators of Star Control". 1998-10: Fans push for a sequel made by Toys for Bob. Paul and Fred tell fans that their campaigns will help make that possible, and that they personally own all rights in Star Control, other than the name and material in SC3. 2000-04: French game publisher Infogrames buys Accolade. 2000: A fourth Star Control game is ultimately scrapped after a few iterations. 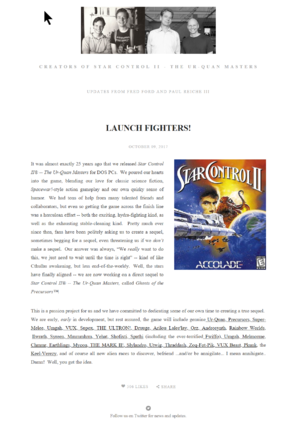 2002-11: The Ur-Quan Masters open source project is released, with Star Control 2 code donated by Toys for Bob. The game is downloaded 100,000 times within one month, and nearly 2 million times from 2002 to 2018. 2003: Infogrames renames company to Atari, after acquiring Atari. 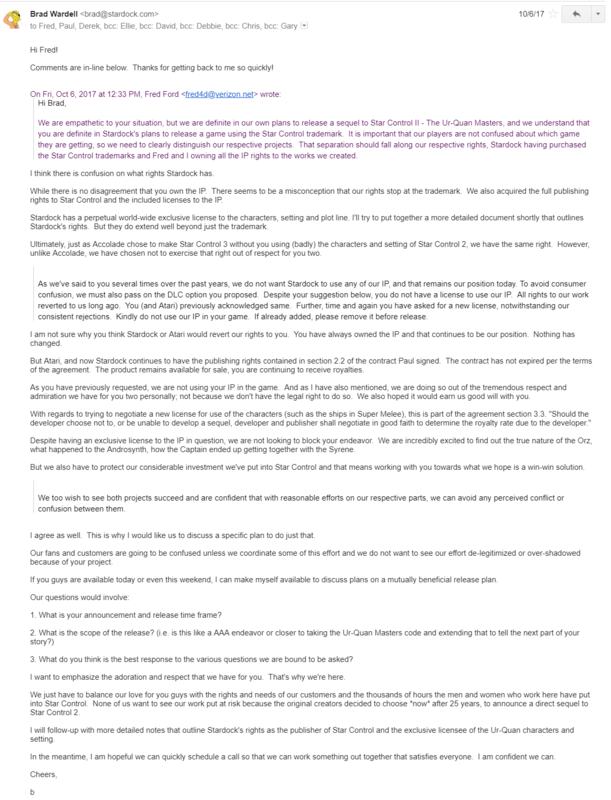 2003-08: Reiche and Ford discuss the Ur-Quan Masters project, and voice their support for the fan community who worked on it. 2005-05: Journalists report that Toys for Bob, "the brains behind Star Control", have been fully acquired by Activision. 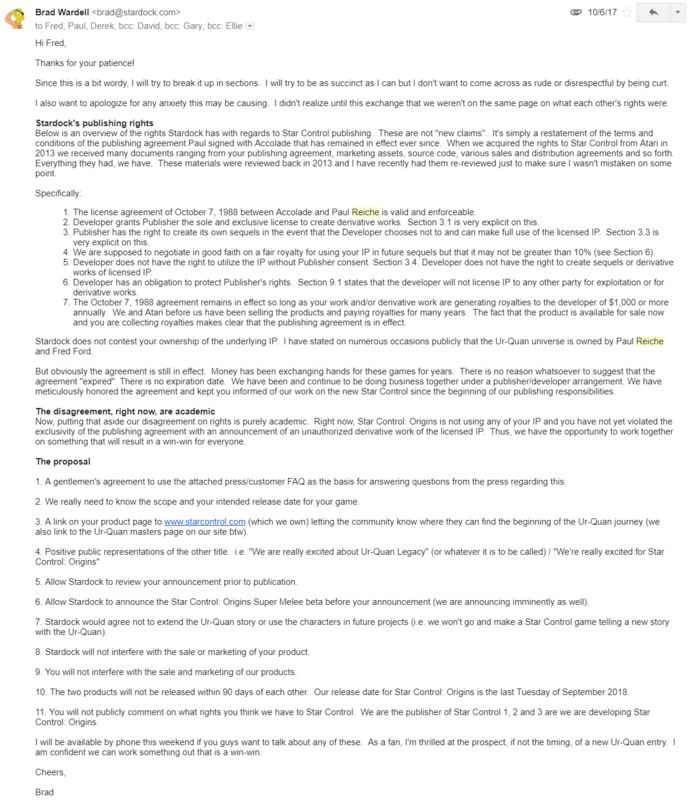 2005-10: Reiche and Ford tell fans they have deliberately kept their rights to Star Control 1 and 2. 2005-12: Star Control 2 is ranked #17 on IGN's top 100 games of all time. 2006-03: Pelit reports that that around the year 2000, Toys for Bob turned down an offer to purchase the Star Control Trademark from Accolade for $50,000, prompting them to consider a Star Control sequel under a different name. 2006-04: Journalists and fans report that Toys for Bob, the creators of Star Control, are organizing an official petition to create a new Star Control, and implies that they have the rights to the franchise. 2006-06: Toys for Bob website reports that "We (I) [written by TFB employee Alex Ness] want us to do a Star Control sequel." 2007-06: Toys for Bob website reports "we have talked to our parent company Activision about doing a Star Control sequel, quite seriously, and there did honestly seem to be some real live interest on their part." 2007-09 Atari renews the Star Control trademark, which Reiche and Ford later argue as invalid in their counterclaim. 2007-12: In IGN's top 100 games list honoring Archon, they note Paul Reiche as half of the partnership that made Star Control. 2008-12: IGN includes Star Control in a list of 10 games they would most like to see another sequel. 2010-08: In a forum thread about an SC sequel, Fred Ford writes "I want to mention that I've started doing some unspecified work away from the office after some early and continuing conversations with Paul." He further states "It will definitely be in our spare time for a while...this is not a TFB venture. It is a Paul and Fred venture." 2010-08: An unofficial fan interview quotes Fred Ford as planning a 2D Star Control sequel as personal side-project. 2011-01: IDDQD reports that Toys for Bob would like to make a true sequel to Star Control. 2011-04: Star Control 1 and 2 are announced for sale on GOG. 2011-04: Reiche and Ford contact Atari saying Atari's "rights lapsed many years ago". Atari responds, "I had our attorney check this out and you are correct." They negotiate a new distribution arrangement. 2011-06: An Engadget profile on Toys for Bob notes Paul Reiche as the co-creator of Star Control. 2011-10: In an interview with CVG, Paul Reiche announces: "we promise someday, we will make the real sequel" to Star Control. 2011-11: A Kotaku profile on Paul Reiche notes him as co-creator of Star Control. 2012-10: In the leadup to another Toys for Bob game, Kotaku, Wired, and Destructoid all describe Toys for Bob as creators of Star Control. 2013-01: Atari (formerly Infogrames) files for bankruptcy. 2013-07: Stardock announces that they have acquired Star Control assets from Atari, in bankruptcy sale. 2013-07-24: Stardock tells fans that Reiche and Ford directly own the copyright in Star Control 1&2, and may be able to work on a new Star Control game. 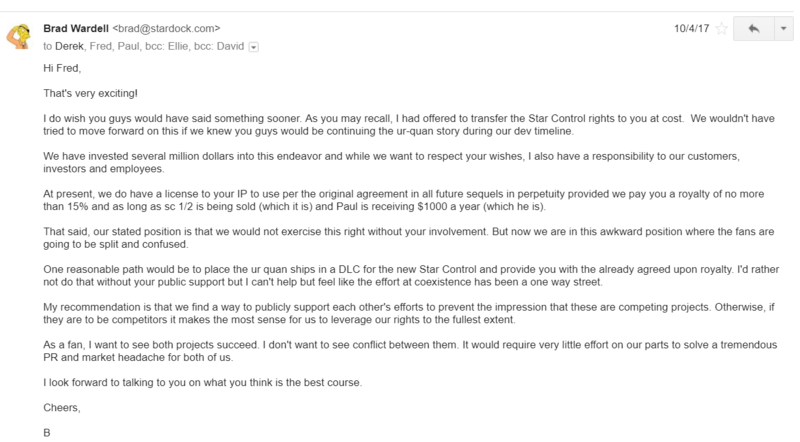 2013-09-16: Stardock CEO asks Reiche and Ford to be involved in new Star Control game. They decline, stating "Fred and I are just not comfortable handing over our world to be developed by others". 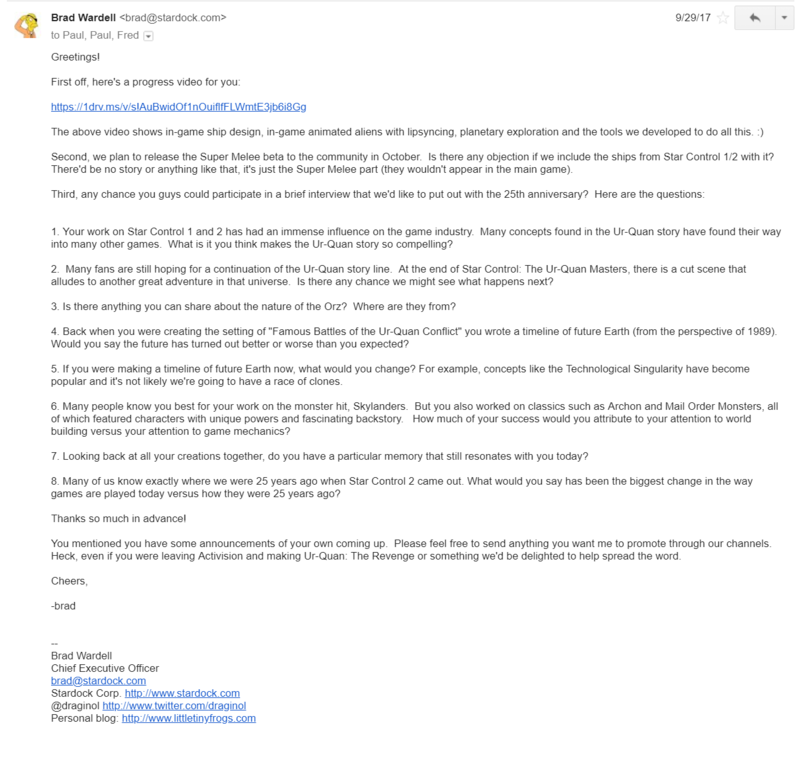 2013-09-16: Stardock responds by offering to sell "the IP rights we acquired from Atari", for the price "at our (Stardock's) cost". 2013-10-16: The parties discuss "the total Star Control rights and assets you acquired from Atari" and Stardock's cost in acquiring them. 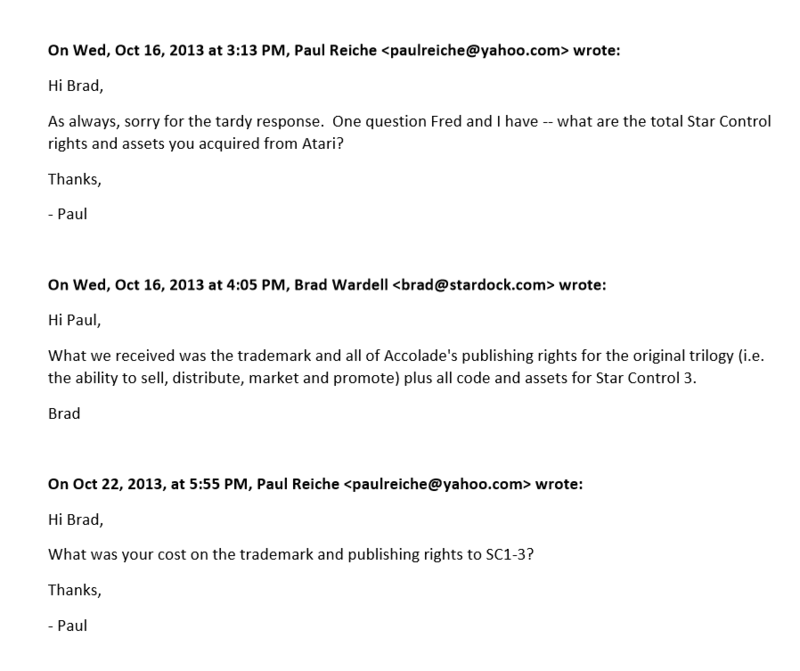 2013-10-25: Stardock again asks Reiche and Ford if they want to purchase these assets. Reiche and Ford decline. 2014-01 Stardock announces development of new Star Control game with independent storyline. Says "we will be talking to Paul and Fred as we go forward" and they "cannot be officially involved at present". 2015-03: Stardock CEO meets Reiche and Ford at booth at Game Developers Conference. 2015-09: Stardock CEO publicly states that Reiche and Ford have been "very supportive", and that "Stardock doesn't have the legal rights to the original (Star Control) lore either. Or, if we did, we have long since refuted those rights." 2015-10: Stardock CEO updates Reiche and Ford on development. Reiche and Ford again decline involvement, as they "want to keep our copywritten material from Star Control exclusive to our own future project". 2015-11: Stardock CEO publicly states that "I don't believe anyone but Paul and Fred have the rights to mess with the Ur-Quan lore and aliens", and that they own "personal, common-law copyright". 2016-10-18 Stardock releases teaser for Star Control: Origins. 2017-09-15: Stardock CEO allegedly asks Reiche and Ford to license the ships from Star Control 1 and 2, in exchange for a royalty. 2017-09-29: Stardock CEO asks Reiche and Ford to use ships from Star Control 1 and 2, and to participate in Stardock's Star Control anniversary plans. 2017-10-04: Reiche tells Stardock that Activision has allowed them to make "a sequel to Star Control 2", which they will announce soon. They decline to license any IP. 2017-10-04: Stardock CEO responds that "we do have a license to your IP to use per the original agreement" and offers "coexistence" by licensing the ships at the "already agreed upon royalty". 2017-10-06: Reiche offers "our respective rights" are Stardock owning the Trademark, with Ford/Reiche "owning all the IP rights to the works we created". Reiche states that Stardock already acknowledged license had expired. 2017-10-06: Stardock CEO responds that license is still valid under section 2.2, as "you are continuing to receive royalties", and suggest working on a "mutually beneficial release plan". 2017-10-06: Reiche responds that "section 2.2 lapsed many years ago", and ask Stardock for their position on IP rights. He further states "as a courtesy, our anniversary announcement is imminent". 2017-10-06: Stardock CEO responds by referring to section 2.2, and that royalties are still being paid. Suggest coordinated announcements, that Stardock owns Trademark and license to sell original games. 2017-10-07: Reiche responds "there were many years where we received nothing" until GOG began selling the games, and that caused section 2.2 to lapse "decades ago", with no chance to regain those rights. 2017-10-09: Reiche and Ford publicly announce Ghosts of the Precursors as a "direct sequel to Star Control II -- the Ur Quan Masters". 2017-10-19: Stardock begins selling Star Control 1, 2, and 3, along with pre-orders for Star Control: Origins, on Steam. 2017-10-19: Stardock CEO gives an interview describing Star Control multiverse, with mockups and images connecting both games. 2017-11: Alleged/unknown discussions continue between Stardock and Reiche/Ford. 2017-11-16: Stardock releases Star Control Fleet Battles Beta. 2017-12-08: Stardock files legal claim against Reiche and Ford. 2017-12-14: Stardock files application for Trademark in "Ur Quan Masters". 2018-01-26: Reiche and Ford file application for Trademark in "Ur Quan Masters". 2018-02-22: Reiche and Ford file defense and counterclaim against Stardock. (16) - February 22, 2018 - ANSWER to Complaint with JURY DEMAND by Robert Frederick Ford, Paul Reiche III. (17) - February 22, 2018 - COUNTERCLAIM against Stardock Systems, Inc.. Filed by Paul Reiche III, Robert Frederick Ford. (38) - April 16, 2018 - ANSWER TO COUNTERCLAIM 17 Counterclaim, by Stardock Systems, Inc.
(46) - June 21, 2018 - Letter from All Parties re Compliance with Discovery Meet and Confer per Section 9 of ND's Guidelines for Professional Conduct. (54) - Answer to Amended Counterclaim by Stardock Systems, Inc.
(55) - ERRATA to Answer to Amended Counterclaim by Stardock Systems, Inc.
(56) - MOTION by Stardock Systems, Inc. for Temporary Restraining Order against DMCA. (104) MOTION to Dismiss Count Nine of Second Amended Counterclaim filed by GOG LIMITED, GOG POLAND SP. Z.O.O. Dogar and Kazon - Star Control® I, II and III aren't for sale on GOG.com anymore -- How come? Dogar and Kazon - Stardock Claims We Are Not the Creators of Star Control. Sues Us. WTF?! (Suspended): "Precursors" (Intent by Paul Reiche III): (Suspended) (Blocked by "Remnants of the Precursors", which is blocked by "Ghosts of the Precursors", which is suspended pending litigation). 2026-03-18: "Star Control" (Use by Stardock Systems, Inc.): (Registered) - Originally by Accolade, Inc.
Summary: Current practices and laws regarding of United States Federal Trademarks. Summary: Current United States Federal Trademark guide to determine how to appropriate examine a trademark for validity. Kellogg Co. v. National Biscuit Co.
Summary: "Kellogg Co. v. National Biscuit Co., 305 U.S. 111 (1938), is a United States Supreme Court case in which the Court ruled that the Kellogg Company was not violating any trademark or unfair competition laws when it manufactured its own Shredded Wheat breakfast cereal, which had originally been invented by the National Biscuit Company (later called Nabisco). Kellogg's version of the product was of an essentially identical shape, and was also marketed as "Shredded Wheat"; but Nabisco's patents had expired, and its trademark application for the term "Shredded Wheat" had been turned down as a descriptive, non-trademarkable term. The Court therefore "forcefully applied the principle that once a patent has expired, its benefits are to be freely enjoyed by the public." Kellogg has been called possibly "the Supreme Court's most versatile and influential trademark decision". It had a direct impact on the structure of the Lanham Act and is a "routine starting point for analysis in trademark opinions in lower courts."" Significance: Foundational court case that helped write the Lanham Act and established the Functionality Doctrine. Summary: "The Lanham (Trademark) Act (Pub.L. 79–489, 60 Stat. 427, enacted July 5, 1946, codified at 15 U.S.C. § 1051 et seq. (15 U.S.C. ch. 22)) is the primary federal trademark statute of law in the United States. The Act prohibits a number of activities, including trademark infringement, trademark dilution, and false advertising." Significance: These are the laws that serve as the basis of the counts by Stardock's claim. Court Cases related to the Lanham Act: These are court cases that showcase the use of the Lanham. Summary: "In United States trademark law, the functionality doctrine prevents manufacturers from protecting specific features of a product by means of trademark law. There are two branches of the functionality doctrine: utilitarian functionality and aesthetic functionality. The rationale behind functionality doctrine is that product markets would not be truly competitive if newcomers could not make a product with a feature that consumers demand. Utilitarian functionality provides grounds to deny federal trademark protection to product features which do something useful. Patent law, not trademark, protects useful processes, machines, and material inventions. Patented designs are presumed to be functional until proven otherwise. Aesthetic functionality provides grounds to deny trademark protection to design features which are included to make the product more aesthetically appealing and commercially desirable. Aesthetic features are within the purview of copyright law, which provides protection to creative and original works of authorship." Summary: In law, use in commerce is a very broad and vague definition. "Commerce" does not imply "Commercial" as the two often have different definitions within certain contexts of law. "Use in commerce" definition can vary based on the context, but trademark specific examples are given. Commerce. The word "commerce" means all commerce which may lawfully be regulated by Congress. on services when it is used or displayed in the sale or advertising of services and the services are rendered in commerce, or the services are rendered in more than one State or in the United States and a foreign country and the person rendering the services is engaged in commerce in connection with the services. An important note from this section of the TMEP is 901.03: "Offering services via the Internet has been held to constitute use in commerce, since the services are available to a national and international audience who must use interstate telephone lines to access a website. See Planned Parenthood Fed'n of Am., Inc. v. Bucci, 42 USPQ2d 1430 (S.D.N.Y. 1997) , aff'd, 152 F.3d 920 (2d Cir. 1998) (Table)." Summary: There are five levels of trademark strengths, each with different requirements that need to be met in order to receive Federal Trademark Protection. Summary: "In the United States, trademark law includes a fair use defense, sometimes called "trademark fair use" to distinguish it from the better-known fair use doctrine in copyright. Fair use of trademarks is more limited than that which exists in the context of copyright." Nominative Fair Use: "referencing a mark to identify the actual goods and services that the trademark holder identifies with the mark. For example, it is not a trademark violation to refer a printer produced by Casio as a "Casio printer"." Descriptive Fair Use: "Using the mark in an ordinary, descriptive manner to describe a product or service. For example, the Paul Simon song, Kodachrome, uses a trademark for a film brand, but within the context of describing film and photographs." "(4) That the use of the name, term, or device charged to be an infringement is a use, otherwise than as a mark, of the party’s individual name in his own business, or of the individual name of anyone in privity with such party, or of a term or device which is descriptive of and used fairly and in good faith only to describe the goods or services of such party, or their geographic origin;"
"(8) That the mark is functional"
Summary: "Rogers v. Grimaldi, 875 F.2d 994 (2d Cir. 1989) is a trademark and intellectual freedom case, known for establishing the "Rogers test" for protecting uses of trademarks that implicate intellectual freedom issues." "the use of the mark has no artistic relevance to the underlying work whatsoever,"
Summary: Depending on the district of the court there are a number of factors use when determining whether another mark will cause confusion against another mark. The 9th Circuit Courts use the Eight Sleekcraft Factors.